Unlikely as it seems, Britain is on the highest terror alert. Government advisors have warned that it could be ten or twenty years before the country is off alert. Building shelters in our cellars and hoarding tinned food and bottled water feels like an overreaction – what exactly should we do to prepare for disaster? Prescription medicine: spare packets of any medicine taken by you or your family, including asthma inhalers, allergy tablets, and heart condition drugs. Clean clothes for everyone, plus spare underwear, waterproofs and sturdy shoes. Food: choose tinned food that you don’t mind eating cold!Chocolate is a good source of energy. You might also need milk formula for babies; water in bottles (take more than you think – we need to drink about a litre every day); and pet food. Important documents, such as marriage and birth certificates, plus any financial documents, should be kept safe at home and copies at another location. Co-ordinate your communications now and, in the worst-case scenario, your family and friends will be able to check on your whereabouts. In an emergency, people are often unable to reach one another – families are out searching, or calling police; sometimes whole regions will be hit, or telephone lines go down. It is useful to have a point of contact that all the family knows about - preferably in a different part of the country. Draw up lists of contact telephone numbers, email addresses and mobile numbers, and circulate them to all family members, plus the schools and colleges your children attend. This increases the possibility of getting in contact in case of emergency. If an area is evacuated, it can be difficult to reach friends and family. Agree a meeting place – perhaps a hotel or a house in a different part of the country – to which you will all make your way in case of evacuation. Don’t forget about your pets, who will also need board if they’re turned out of their home. Pick a hotel that accepts animals. 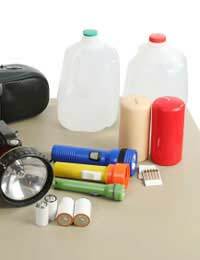 If you are evacuated from your home or workplace, cover up, and take your disaster kit with you (or first aid kit, if there is one available). Check whether any roads or routes are closed or damaged. If you were close to the source of the threat and you may have been contaminated, move away from the source but do not go home. Wait for the emergency services. Think about where your family could be at the time of disaster. At work, at school, at Cub Scouts, at an evening course? Make the relevant officials aware of any medical requirements such as diabetes, asthma, and other conditions that your family members may have. Employers and schools keep medical records, and course organisers usually have a record on file. If you or your family has a serious medical condition, you can consider buying bracelets, cards or tags that identify them to paramedics. If disaster strikes, you may be advised to shelter at home (or “in place”). Lock doors and windows, switch off any ventilation and stay in one room, preferably above ground. Keep a radio tuned into a local station for further information, but be aware that young children may respond badly to disaster reportage.